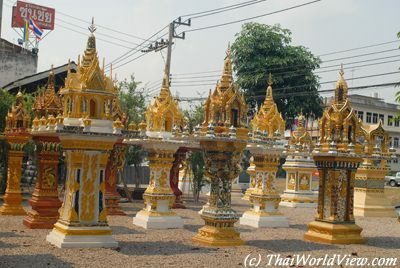 ศาลเจ้าที่ or "SAN JAO THI" means "guardian spirit shrine". 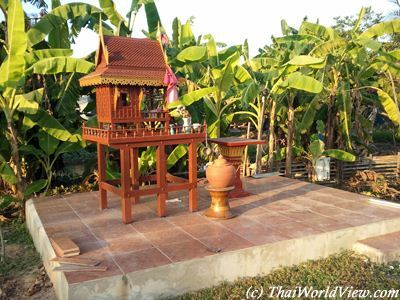 The "SAN JAO THI" is similar to an old wooden Thai house. It is raised above ground level by normally four pillars. 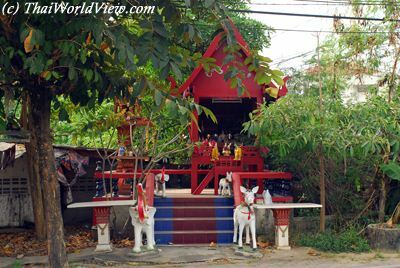 Every house in Thailand has a Spirit House even the Government House! 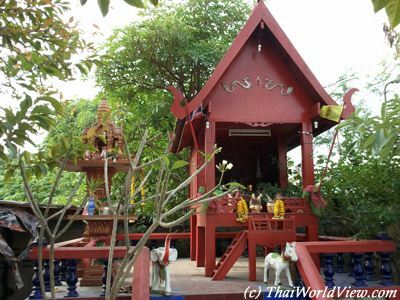 This big spirit house also features additional guardians such as rooster and naga. Naga was the serpent who did protect Buddha when he was meditating. 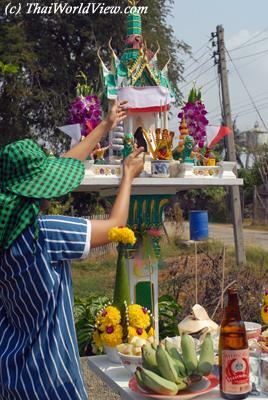 The rooster was liked by former King Naresuan. The smaller Guardian Spirit Shrine is on the right. Famous monk Phra Panyanandha fought against all kinds of claims about supernatural powers including spirit houses. 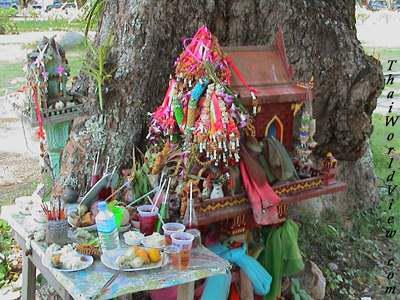 He wanted to remove the superstitious beliefs from Thai society. 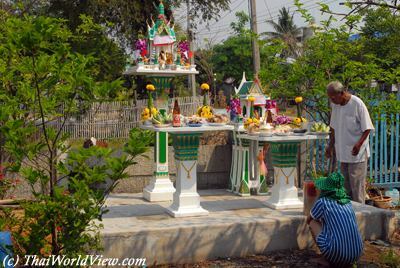 This picture displays a guardian spirit shrine (เจ้าที่ or "CHAO THI") and a "shrine for the Grandfather and Grandmother" (ศาลตายาย or "SAN TA YAI"). 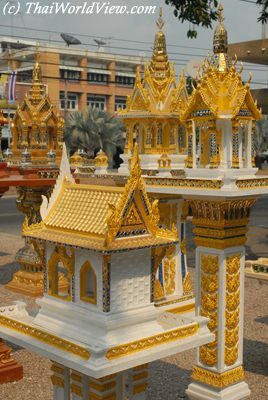 City pillar is similar to a huge spirit house. It is an important shrine housing the city's guardian spirits. Normally when an owner is buying a house or a land, he might want to get rid of the previous spirit house. 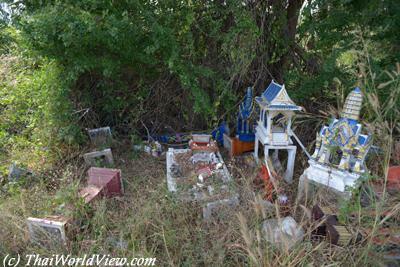 Normally the right place to discard old spirit house is to put them in a Buddhist temple. Some people unproperly throw them away in abandoned areas. 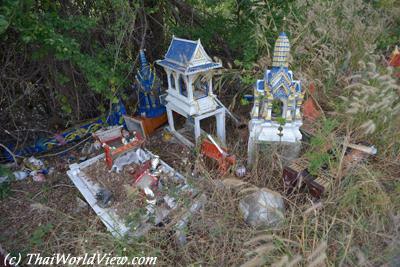 This Buddhist temple contains many abandoned spirit houses. 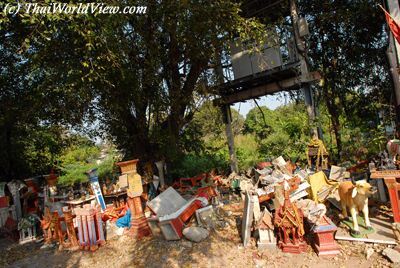 Such items cannot be reused and just stay there in a forgotten state. 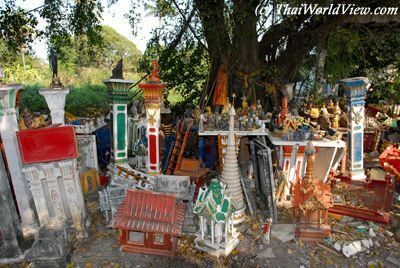 Spirit houses, pillars, figurines are left over under the bodhi tree in this Buddhist temple. 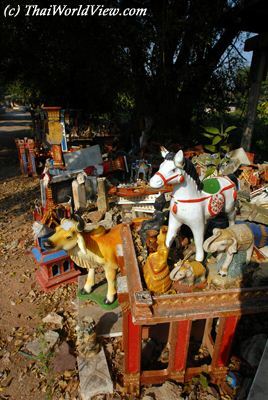 Various animals figurines such as horses, elephants, cows are also left here. Such items are often found in big spirit houses. 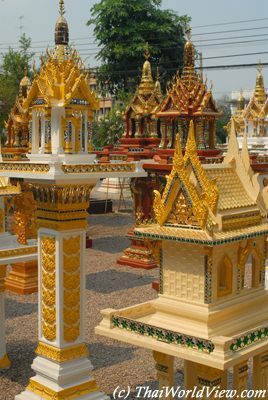 Various statuettes (Buddha, Rama V...) left over in a Thai Buddhist temple. 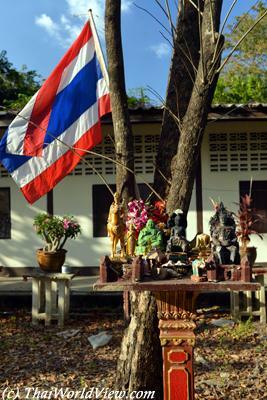 Thai flag adds a last symbolic presence. 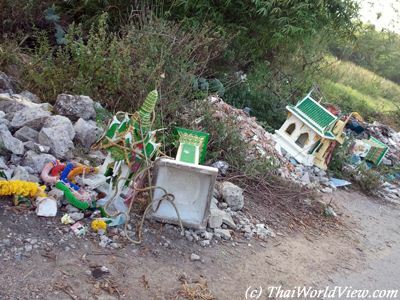 Some Thai people, fed up to see other people throwing their Spirit Houses, even establish some cemeteries to store them! 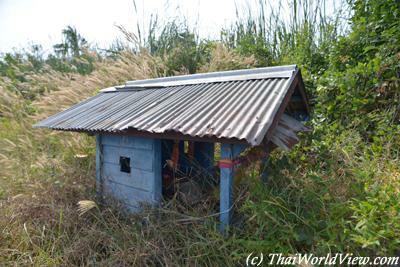 This old village spirit house is even sadly abandoned along the road!! 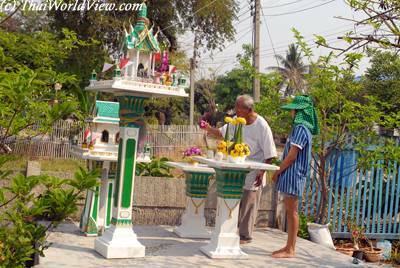 This big shrine (ศาลพระภูมิเจ้าที่) is for a guardian spirit covering an important area. 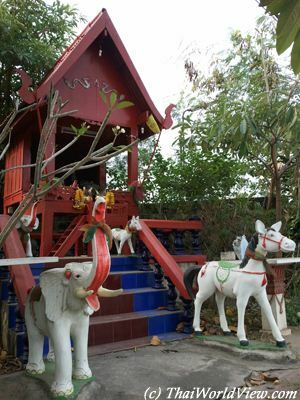 Elephants and horses are used by the guardian spirit to travel more easily. 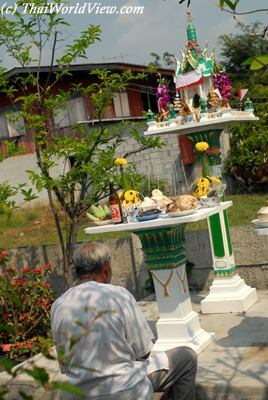 People in the neighbourhood come on a daily basis to make offerings to the local guardian spirit. An expert in setting up spirit houses is hired for this important event. 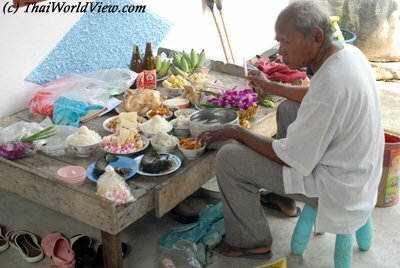 He is checking the offerings prepared for the guardian spirit. 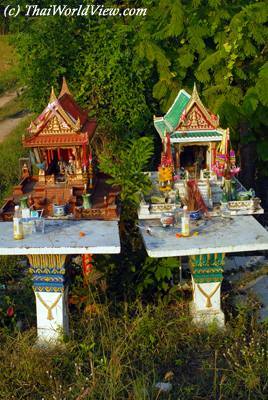 Offering are placed in front of both spirit houses, i.e. 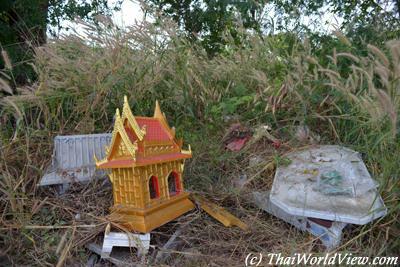 a guardian spirit shrine (ศาลเจ้าที่) and a spirit house. 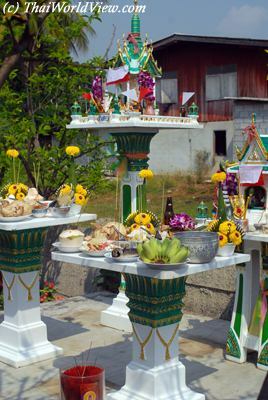 Offerings include flowers, food (rice, chicken...), fresh fruits (banana...), drinks (beer, coconut juice). The expert invites the spirits to come to their new shrines and to protect people living in this house. Food is left a few hours for the spirits to enjoy it. Then it will be removed for humans to finish it! 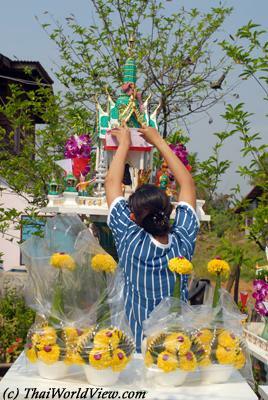 A special cloth is put on the small shrines' roof in order to offer additional protection. Beer bootle is opened. Chicken is steamed. Offerings are ready to be enjoyed by the spirits. The expert is inspecting the location of the shrines. Worth to note that the spirit house is positioned higher than the guardian spirit shrine. 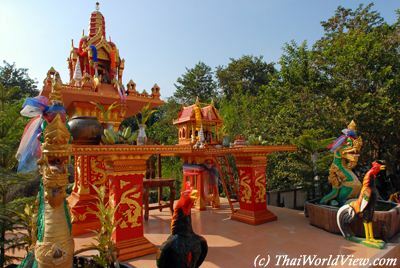 Such colorful shrines often host important deities such as Lord Brahma (พราหมณ์). 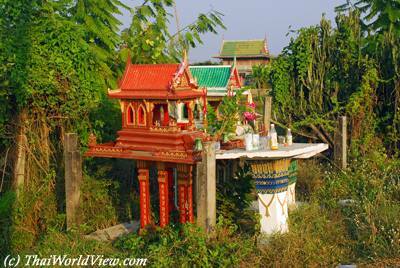 The spirit house (ศาลพระภูมิ) is normally topped with a typical Khmer architectural prang. 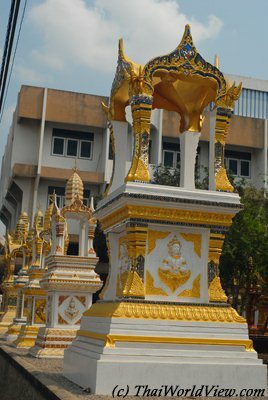 In the foreground, the guardian spirit shrine (ศาลเจ้าที่) is normally standing on four pillars. 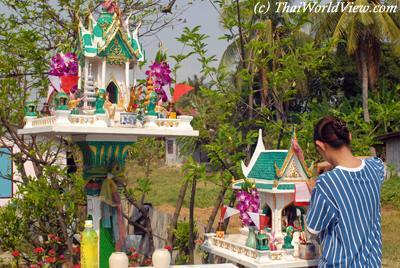 Everywhere in Thailand, shops are selling colorful spirit houses and guardian spirit shrines.